COBI, the developer of the first smart control centre for bikes, has completed another round of financing. The company has received almost €6.3 million from Munich Venture Partners and other investors like Meinders & Elstermann – International Print & Mediaservices. This brings the total investment raised by the company to 12 million Euros. Creathor Venture and Capnamic Ventures, investors from the previous funding round in April 2015, have also increased their investments. COBI will use the fresh capital for internationalization as well as the development of further products. COBI stands for „Connected Biking" and is the first integrated system that intelligently connects a bike with a smartphone. The modular system integrates six bike accessories into one design object: Automatic front and rear light, navigation, smartphone holder with charging function, bell, alarm system, and bike computer. The result not only makes biking safer and more intelligent, but also creates a host of features to enrich your riding experience: It turns any bike or eBike into a Smartbike. The system can be pre-ordered online as an accessory for any bike from between 179 and 330 Euros, and will be pre-fitted by many bike manufacturers. Delivery will begin in time for the biking season in Spring 2016. More than 30,000 pre-orders have already been received. „With the launch of the first COBI product imminent, it’s time to expand our business model and include further products. We are delighted that with Munich Venture Partners we have found a partner who brings with them a great network, and has a clear focus on Cleantech startups." „At Creathor, we are very satisfied with the development of COBI. Most of our expectations from the time of our initial investment were exceeded by the team of COBI. Now, we are looking forward to the market launch this year and we are very happy about the two new investors MVP and Meinders & Elstermann, their expertise and network supporting the further development of the company. " COBI is the specialist for Connected Biking. The company develops and markets an integrated patented system to upgrade bikes with both hardware and software elements. It offers the user access to over 100 integrated features. The COBI team has years of experience in digital business and marketing. COBI was founded by Andreas Gahlert in Frankfurt am Main at the beginning of 2014, and now has more than 50 employees in Frankfurt, Hamburg and San Francisco. COBI became a sensation in December 2014 on the US platform Kickstarter. Raising 400,000 US dollars, the crowdfunding campaign became the second most successful biketech project worldwide and raised four times its target funds. As a leading European Venture Capital firm, Creathor Venture invests in technology-oriented companies and entrepreneurs. Creathor Venture focuses on Mobile, E-commerce, Digital Media, Cloud Technology, Internet of Things, Sharing Economy, Fintech, Life Science and E-Health. Regional focus is on Germany, Switzerland, Austria and Scandinavia. The management team of Creathor Venture consists of the CEO Dr. Gert Köhler, Karlheinz Schmelig, Cédric Köhler and Dr. Aristotelis Nastos. The team has been investing successfully in the early-stage venture capital business for 30 years. During that time, the team has built more than 200 technology companies successfully, conducted more than 20 international IPOs and has achieved exceptional returns for fund investors and the financed entrepreneurs in the past, all in the position as lead investor. The current portfolio of more than 35 companies is actively supported in development, growth and internationalization by a team of 17 staff. 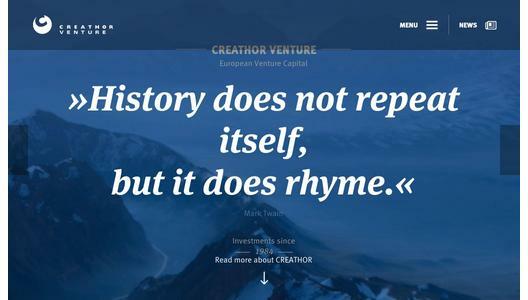 Creathor Venture manages funds of more than EUR 180 million and holds offices in Bad Homburg, near Munich, in Cologne, in Zurich and in Stockholm. The investors of the current fund include the European Union, through which the fund receives funding from the "Competitiveness and Innovation Framework Programme" (CIP), and the "ERP EIF fund of funds" and the LfA - Gesellschaft für Vermögensverwaltung GmbH, both facilities of the European Investment Fund ("EIF"), fund of funds, family offices and entrepreneurs. As the largest investor in Creathor the management underlines its entrepreneurial orientation.